Audition packets are available in the band room (these packets include all of the materials for the ILMEA jazz audition in early October). The SHS jazz audition will include Clue's Blues (the ILMEA commissioned chart), an excerpt from Friends (from Jim Snidero's Jazz Conception Series), and improvisation on Billie's Bounce (F Blues). Click below for recordings. Note that there are two recordings of Billie's Bounce to practice improvisation - the one marked "no piano" is for piano and guitar players only. Schaumburg High School offers 2 extracurricular big bands and 2 small combos as part of its jazz curriculum. The Jazz Lab Band, directed by Mr. Graffeo, rehearses Mondays after-school and performs at least 2 area jazz festivals and our annual Jazz 'n Joe Coffeehouse. The Jazz Lab Band is open by audition to students interested in playing jazz, regardless of if they have played in a jazz band previously. The Jazz Lab Band focuses on elements of jazz style, history, and improvisation through performance. The Jazz Ensemble, directed by Mr. Inendino, rehearses Monday evenings and performs at a variety of festivals and other events throughout the year. The Jazz Ensemble is the top big band at SHS. The SHS Jazz Quintet and Jazz Sextet are made up of a small group of students with an intense interest in jazz improvisation. 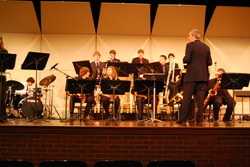 Directed by Mr. Tipps, these groups performs at jazz festivals and several other venues throughout the school year.